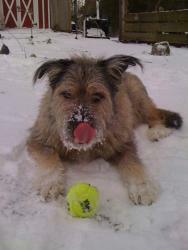 Winter is here and with it comes additional risks and concerns for your pet. You can help your pet through the season with just a few simple changes. Trim excess fur from between toes to prevent “ice pellets” from forming. With excessive exposure, salt used to clear sidewalks causes a chemical burn which can be irritating. Rinse paws in lukewarm water to alleviate discomfort. Limit time outdoors when the temperature is below freezing and the windchill factor is high. Breeds that have thin hair or bare skin should be covered with protection, like coats and boots. Cats are prone to frostbite of the ears and tails – keep them indoors below freezing and try to find homes or shelter for strays in your area. Larger or energetic dogs are prone to injuries, such as cruciate ligament rupture on icy surfaces. Keep walks and trails sanded and avoid play with quick turns and stops on the ice. With less time outdoors cut back the amount of food your pet is getting to avoid weight gain.